This is one hell of a fun show! Curating, directing, marketing, and hanging the show takes a hell of a lot out of you. So as usual, I only had a quick minute to bust something out. Luckily for me its already sold, so don't even ask. 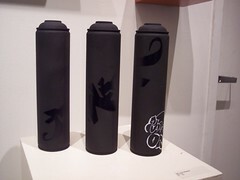 But if you click on the photo, you'll see more great looking cans by the ton of other artists involved.